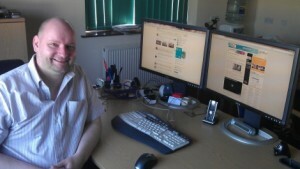 Tom Milner is managing director and owner of Service & Support Ltd, Kettering, Northamptonshire. UK, which provides installation and maintenance services to the AV/IT industries that cover the whole of the UK & Ireland, and into EMEA when requested. The company also works with partners around the world to provide the same services globally. Describe your personal work space. I work in my own office just along the corridor from all my employees where my desk is mostly covered with requests for quotations and I work through an average of 200-300 emails a day. It can be messy, and I’m tied to my desk most of the day. Otherwise, I’m lucky that I go to quite a few of the main AV-related trade shows each year and get to meet with all my customers face-to-face all the time. I’m very lucky to only have a five-minute drive from home to my office. In my previous roles, I’ve always had a round trip of around 200 miles a day so this is very pleasant! My average day is normally a very long one as I’m dealing with customers and partners from all over the world and, even when I’ve left the office, I can be working into the small hours from my netbook at home. I get the most ‘buzz’ from providing the right service to my customers, no matter what the demands or constraints of their requirements. In most respects, my job can be as flexible as I want it to be, but sometimes I have to let my staff have some time off, so I’m not averse to jumping in a van after a normal day’s work to go and get my hands dirty to ensure that my customer’s needs are met. I am available 24/7 and have been ever since the advent of email and mobile phones. As I’m the employer in my case, I look for everything for myself and my employees that should be a basic in any job, a flexible working environment, the reassurance that at the end of the month the salary is in the bank and there is always the opportunity to grow and develop in whatever position we sit. >What suggestions do you have for your company? From my younger days of working at Tektronix – Work Smarter, Not Harder! Do you have any frustrations you would like to share with us? I have been employed in many different industries, varying between construction; mechanical and electrical project management; IT field service engineering and management; and where I sit now in the AV industry, specializing in digital signage and video conferencing. Each industry has its own issues but certainly, within the AV industry as a whole and the current financial climate (which gets better day by day! ), my biggest frustration is sharing my customer’s frustrations that often the end user customers don’t really know what they want and so often it’s a struggle to help them. I am my own boss! What I say goes and I can recommend it to anyone! All of it! I’m very lucky that my Team that I employ is made up of people that I’ve worked with for the last 20 years. We have our ups and downs but ultimately we do enjoy working together. We work within the constraints of a modern services business working within industry standard regulations. Our Head Office is a very modern unit that is A rated for energy efficiency. I’m always inspired by intelligent thinking and watching my business and my team grow, it is very exciting to grow a business from nothing! For my business – to continue the solid growth that we have already achieved and to provide our customers with ‘best of breed’ services that cannot be beaten. For me – to grow the business to a point that eventually I can take a bit of a breather! If you could change only one thing, what would it be? To be able to afford more staff during our current growth spurt that would mean my team and I could have a slightly easier life. A lot! My approach to market is all about networking and getting in front of new customers, I use websites like Linkedin and Twitter all day long to introduce my business to new customers and, so far, this has been extremely successful. I can easily say that between a third and half of my new business is as a direct result of using Linkedin and Twitter. Of course, I also use websites like DailyDOOH, Inavate, AV Magazine and all the others to see all the gossip and happenings within the industry! Linkedin, Twitter, Email, Word, Excel and my smartphone. I’ve got it….living the dream! What makes you laugh during the workday? I can go through so many different emotions all day long but being able to laugh no matter what is key to our success so far and I come to work to have fun as well as developing a successful business! This entry was posted on Monday, April 2nd, 2012 at 18:01 @792 and is filed under Will Work For Love. You can follow any responses to this entry through the RSS 2.0 feed. You can leave a response, or trackback from your own site. The title says it all: will work for love! That’s exactly how I know Tom and why I really appreciate our partnership. Tom is absolutely devoted to his company and his business, but he also has a broad and deep understanding of the digital signage market. I love to discuss future developments with Tom, anticipating our next moves together. Last but not least, it’s also fun to work with Tom.